The Camden CV-601 MPROX is a single door access control kit for use in industrial or commercial buildings using proximity cards or key tags. It consists of two parts: a small controller (also sometimes referred to as a programmer) that is installed on the secure side of an establishment and a weather resistant mullion mount proximity reader. It has a capacity of up to 999 users. 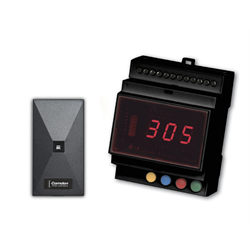 Compatible cards or fobs can be deleted either individually or in batches through either the readers or controller. Dimensions: 4 1/2" x 1 3/4" x 3/4"